Modular hand / arm rehabilitation system "HARE"
The restoration and support of arm and hand functions is important for an independent, self-determined life at home. 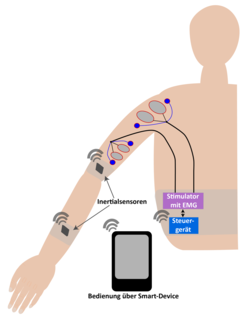 Due to the degrees of freedom in movement of the arm and hand the development of intelligent assistance and therapy systems for the upper limb represents a major challenge. 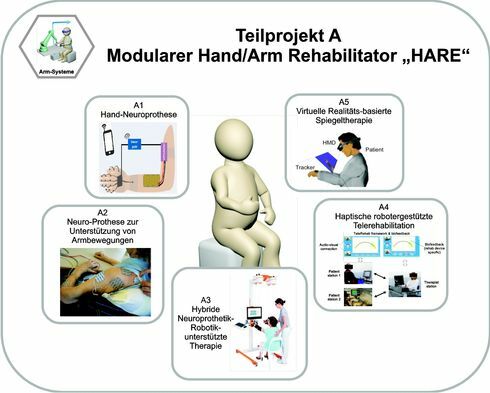 The hand / arm rehabilitator HARE consists of five modules, which can be flexibly combined as required and used in the rehabilitation process as well as in the home environment. 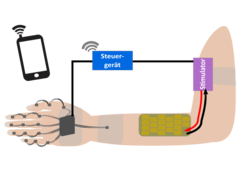 Neuroprosthetic supply for stroke patients and paraplegics. The paretic muscles of the hand can be reactivated using artificial transcutaneous nerve stimulation. Our adaptive hand neuroprostheses is going to enable patients with a hand paresis to manipulate objects of the daily live. Automatic adaption to the patient is necessary because of the high variance of the patient impairment. A small mobile stimulation device is combined with newly developed electrode arrays, which consist of multiple small stimulation electrodes, selectable via control algorithm. 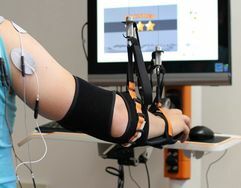 This feedback controlled stimulation system is used to generate functional hand and finger movements. In order to continuously adjust the stimulation parameters, the hand and finger posture is measured by a novel IMU based sensor system. This neuro-prosthetic device is applied to the upper extremities to support arm functions in patients suffering from a partial paralysis. By continuously measuring the joint angles of the arm, the stimulation level of the involved muscles (biceps, triceps and deltoid) is adjusted to achieve a force amplification and, hence, an arm weight relief. This enhances the reachable range of motion to a large extend, whereas all movements are still volitionally controlled by the patient. Further, an automatic and continuous adaptation of the system to patient-individual needs is realized by measuring the volitional activity using Electromyography (EMG). We combine Functional Electrical Stimulation (FES) with an endeffector-based cable-driven robotic system (Diego, Tyromotion GmbH) for the rehabilitation of stroke and spinal-cord injured patients. The aim is the development of an extended assist-as-needed therapeutic approach, at which the patient as much as possible contributes to the movement. Remaining deficits are then firstly compensated by the FES and only thereafter by the robotics. Furthermore, horizontal arm movements, which can not be actuated by the robotics, are supported by FES. The objective of the project is an integrated haptic telerehabilitation system for domestic neurological rehabilitation. This system shall enable for the first time the continuation of an intensive and highly qualitative exercise therapy treatment of the upper limbs (arm/hand), along the patient care pathway from inpatient rehabilitation in the rehab clinic to outpatient rehab at the patient’s domestic environment. The concept comprises two modes: i) the synchronous tele care mode and ii) the asynchronous autonomous mode. The tele care mode is an audio-visual and, for the first time, haptic real-time interaction between therapist and patient. In the autonomous mode, the patient performs the therapy exercises all on his one at home. A virtual reality (VR) - based mirror therapy system is developed, which instantiates an efficient VR movement therapy environment usable without prior technical knowledge. The VR system is linked to a multi-camera markerless motion tracking system. It significantly augments the possibilities of conventional mirror therapy. By implementing a standardized therapy protocol and by incorporating the possibilities of new media, a motivating new form of mirror therapy is created. Due to close collaboration between medical staff and engineers, the new VR system will be a clinically effective therapy tool and promote patients’ compliance by intrinsic motivation.